MidSouth Crawlspace Solutions is the crawl space vapor barrier authorized dealer for Basement Systems, Inc serving Mississippi. 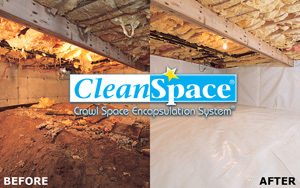 The CleanSpace® Crawl Space Encapsulation System seals a crawl space off from moisture coming up from the dirt and also from the damp air outside and creates healthy home environments. The encapsulation system comes with a 25-year CleanSpace® warranty against rips, tears & groundwater, and from having groundwater on top of the liner. You will also have added peace of mind knowing how quickly your crawlspace can be fixed with little or no disruption to your daily routine.